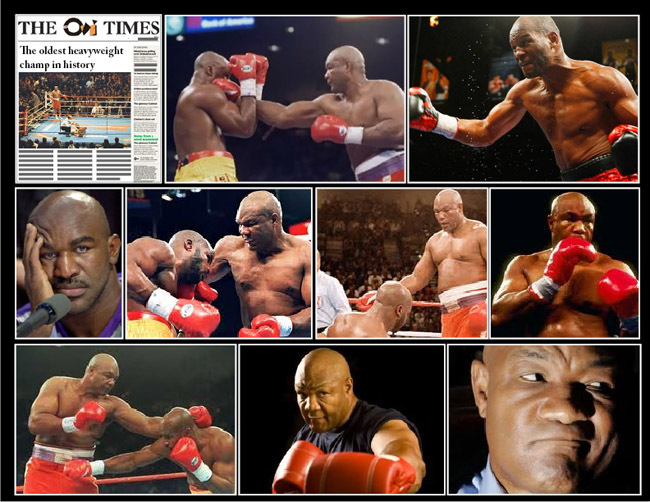 On November 5, 1994, 45-year-old George Foreman knocks out 26-year-old Michael Moorer and becomes the oldest heavyweight champ in the history of boxing. Foreman had been the champ once before, until Muhammed Ali took the belt from him in 1974’s "Rumble in the Jungle," but he’d taken 10 years off from boxing to become an evangelical preacher, pitchman for mufflers and hamburgers, and sitcom star. Moorer, for his part, was a young lefty with a 35-0 record who expected to coast through the bout, collect a hefty paycheck and retire a champion. And he was coasting through the bout, until Foreman floored him in the 10th round. Though the older man was no longer the fighter he had once been, he was fighter enough: As one columnist observed, that day Moorer "floated like an elephant and got his trunk shoved down his throat." The fight almost didn’t happen: At first, the World Boxing Association had refused to sanction it, mostly because of Foreman’s age but also in part because of his abysmal record in recent fights. Foreman’s promoter sued the W.B.A. and won, on the grounds that age discrimination is illegal, and the fight was allowed to proceed.